A 28 years old pregnant women was scanned in the third trimester. The left lung is hyperechoic and enlarged. The heart is pushed to the right side, is compressed and therefore small. The right lung is compressed and hypoplastic. There is hydrops due to cardiac failure : bilateral pleural effusion, a small amount of ascites and generalised edema in the sub-cutaneous tissue. Since the heart and the great veins draining into the right heart (SVC and IVC) are compressed, the heart remains small in size. This reduces the venous return to the right atrium, and also the stroke volume of the heart. This is manifest as cardiac failure and consequent hydrops. 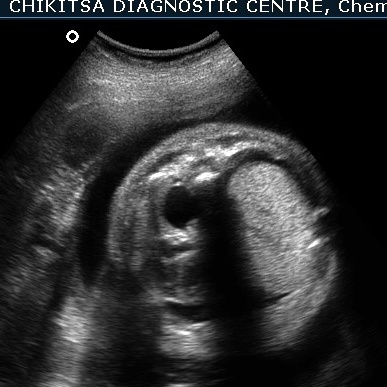 The differential diagnosis of echogenic areas in the fetal chest include congenital diaphragmatic hernia (CDH), cystic adenomatoid malformation (CAM), sequestrated lung and tracheal or bronchial atresia. 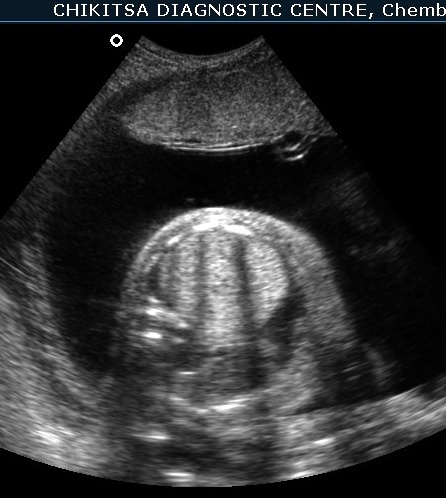 King et al, in a review of echogenic lung lesions by prenatal Sonography presented that the prenatal diagnosis was correct in 13 of 17 fetuses with echogenic lung masses. Therefore it is clear that a conclusive diagnosis of bronchial atresia may not always be possible. Bronchial atresia may involve the main bronchi, lobar bronchi, segmental or sub-segmental bronchi. Congenital bronchial atresia is a rare anomaly that results from focal obliteration of a main, lobar, segmental or sub-segmental bronchus. Bronchial atresia most often affects segmental bronchi at or near their origin. The airway develops systematically: the lobar bronchi, subsegmental bronchi, and distal bronchioles appear in the 5th, 6th, and 16th weeks of fetal development, respectively. In bronchial atresia, though the lung tissue distal to such an atretic portion of the bronchial system lacks communication with the central airways, the development of distal structures usually normal. This supports the theory that bronchial atresia results from an antenatal vascular insult leading to atresia of a main, lobar or segmental bronchus, after 15 th intra-uterine week. As reported by Schuster et al, the bronchial pattern is entirely normal distal to the site of stenosis, and therefore the atresia is not a result of abnormal growth and development, but rather a focal affectation secondary to a traumatic event during fetal life. Raynor et al reported cases of secondary bronchial atresia caused by the presence of a mucosal flap, hypertrophy of bronchial mucosa, bronchial kinking secondary to herniation, or external compression of bronchi by abnormal vascular formation, such as patent ductus arteriosus and aneurysm of a pulmonary vein. Poor antenatal outcome is associated with mainstem bronchial atresia rather than lobar atresia. Accurate determination of the anatomical level of obstruction may not be reliably possible on antenatal Sonography. 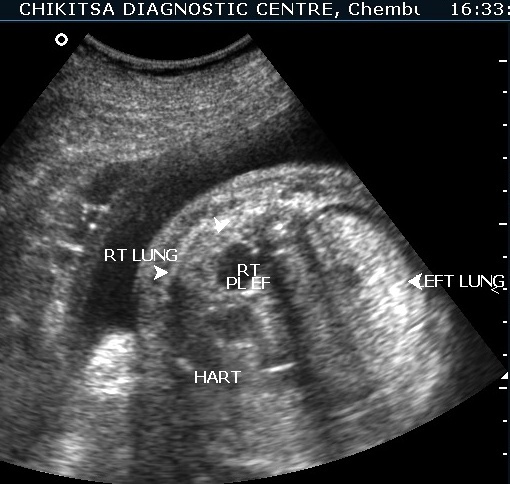 Even lobar bronchial atresia may present as a large pulmonary echogenic mass seemingly occupying the full extent of the lung with major mediastinal shift and eversion of the diaphragm. Hadchouel and colleagues noted that distal bronchial atresia is an etiology for hyperechoic lung lesions, and that the natural history of hyperechoic lung lesions is favorable in most cases. Therefore, is not not automatically necessary to terminate a poregnancy with suspected bronchial atresia. In the newborn period, bronchial atresia is seen as a water-density mass on Xray chest.The mass is fetal lung liquid trapped behind the atresia. In childhood, the fetal lung liquid escapes and bronchial atresia is found because of focal air trapping. The short atretic segment leads to accumulation of mucus within the distal bronchi to form a bronchocele, and underventilation of the affected part of the lung occurs. In adults, bronchial atresia characteristically is seen as a solitary pulmonary nodule due to a mucus plug. The bronchocele may contain an air-fluid level. The distal lung is emphysematous and produces an area of hyperlucency around the affected bronchi. The abnormality is an incidental finding in approximately 50% of cases, mostly in young men, and generally produces no symptoms or signs. 2)Ramsay BH, Byron FX. Mucocele, congenital bronchiectasis, and bronchogenic cyst. J Thorac Surg. 1953;26(1):21-30. 3)Jederlinic PJ, Sicilian LS, Baigelman W, Gaensler EA. Congenital bronchial atresia. A report of 4 cases and a review of the literature. Medicine (Baltimore) 1987;66(1):73-83. 4)Kinsella D, Sissons G, Williams MP. The radiological imaging of bronchial atresia. Br J Radiol. 1992;65(776):681-685. 5)Poupalou A, Varetti C, Lauron G, Steyaert H, Valla JS. 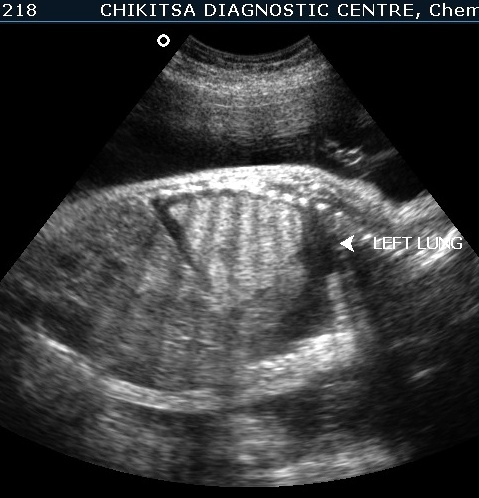 Prenatal diagnosis and management of congenital bronchial stenosis or atresia: 4 cases. J Thorac Cardiovasc Surg. 2011;141(1):e11-4. 6)Griffin N, Devaraj A, Goldstraw P, Bush A, Nicholson AG, Padley S. CT and histopathological correlation of congenital cystic pulmonary lesions: a common pathogenesis? Clin Radiol. 2008;63(9):995-1005. 7)Schuster SR, Harris GB, Williams A, Kirkpatrick J, Reid L. Bronchial atresia: a recognizable entity in the pediatric age group. J Pediatr Surg. 1978;13(6D):682-689. 8)Raynor AC, Capp MP, Sealy WC. 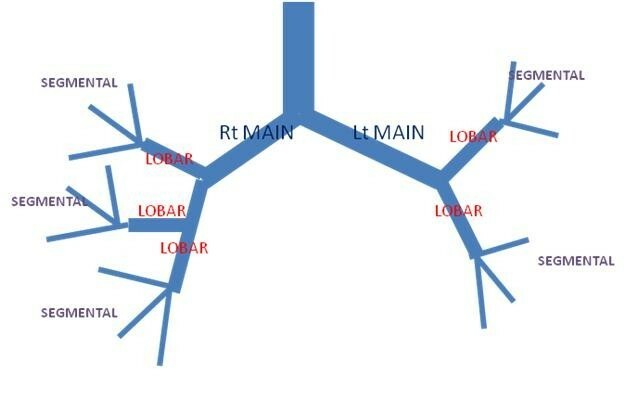 Lobar emphysema of infancy: diagnosis, treatment, and etiological aspects-collective review. Ann Thorac Surg. 1967;4:374.